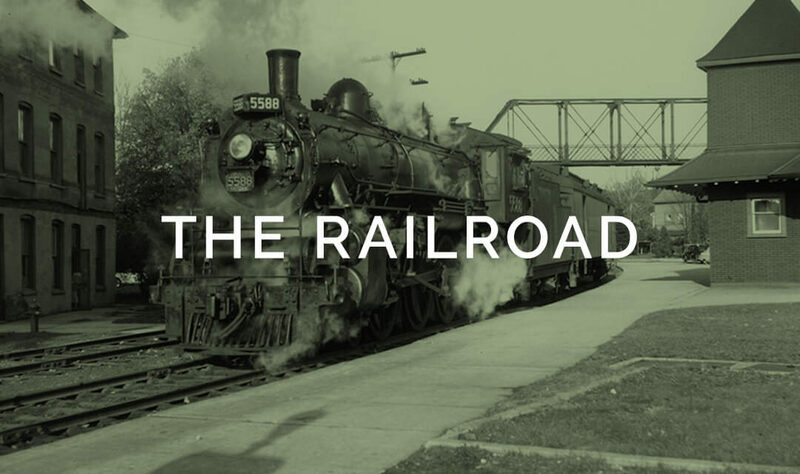 By December 13, 1867, the Township of Minto had come to an agreement with the Wellington Grey and Bruce Railway Company [WG&B] that would allow their line to be carried from the town of Guelph to a point within one mile of the village of Harriston. At this point, it was agreed that a freight and passenger station was to be erected and maintained so the line could continue northward within one mile of the village of Clifford. The point where the station was to be constructed would eventually grow into the Town of Palmerston. A line to go through this point was needed by the Wellington, Grey and Bruce Railway, who had at the time a line running from Hamilton through Guelph to Southampton, but desired a connection to Kincardine. This rail line was expected to run within seven and a half miles of Listowel. At the time there had been some concern that had there not been a switch provided to allow the railroad to travel into Listowel, the Listowel economy and existence of the town would be in jeopardy. By 1871 buildings began to be erected in the area of the vicinity of the proposed new station. In February of 1871, M.G. McGaffin had provided, free, three acres of land and one hundred dollars for the erection of a saw mill, a shingle factory and a flour mill. By December of that year there were also two blacksmith shops in business in the growing village, as well as a large hotel, and two or three storekeepers had set up shops. The railway had attracted so many people within its first two years of operating that the population of Palmerston had doubled between 1873 and 1874 to 1,693 citizens. This dramatic increase in population allowed the town to skip its application to be designated as a village and to apply directly to be incorporated as a Town. By August 12, 1882, the Wellington, Grey and Bruce Railway Company formed part of the Great Western Railway Company System and its operation was taken over by the Grand Trunk Railway Company of Canada [GTR]. The Grand Trunk Railway expanded the number of tracks to the yard, as there were up to 40 trains a day travelling through Palmerston by 1910. By 1910 it had been decided to build the bridge over the tracks. The pedestrian bridge was built by the Grand Trunk Railway and opened in 1912. 1912 is also the year considered by many to be the start of the demise of the Grand Trunk Railway. The president of the company had died in the sinking of the Titanic and within ten years of his death, the company had gone bankrupt and been bought by the government-owned Canadian National Railway [CNR]. By 1959 the steam engines had been replaced by diesel engines, which in turn removed the need for much of the yard. The roundhouse, roundtable and coal sheds were then removed. By the early 1960s the passenger transportation and freight businesses were hurt by improved highways, which led to the transportation of mail by road, and no longer by rail by 1964. In 1970, Palmerston saw the last passenger train go through the town, but it remained as a centre for freight transportation. In the 1980s, the CNR made the request of right to abandon the rails through Palmerston, with the station being officially closed in 1982. In 1996 the Canadian National Railway tore up the track from Stratford to Harriston, which left the abandoned station and bridge, which have generously been restored and maintained by a group of community volunteers.